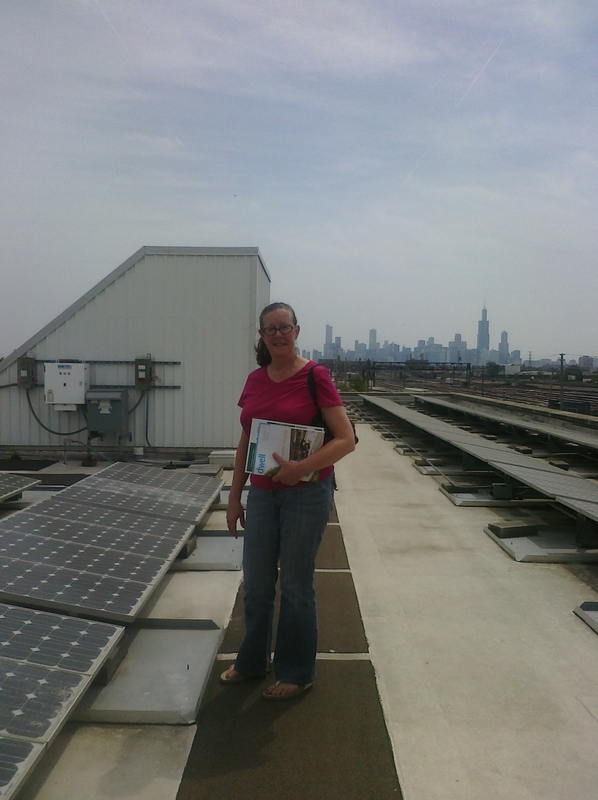 On Saturday Sue and I headed to the Chicago Center for Green Technology to celebrate their tenth anniversary. This building was the first LEED Platinum public building in the United States. It’s an excellent example of revitalizing a brownfield into a sustainable property. In its ten years, CCGT has been home to sustainable businesses, GreenCorps Chicago, and countless educational events and workshops. We were thrilled to see their energetic staff and volunteers showing off the building: passive solar lighting, non-toxic finishes of all kinds, furniture from reclaimed wood, smart energy controls, a green roof and more. If you haven’t been to CCGT in a while or–gasp–if you’ve never been there, make sure to do so this summer. Learn about their class schedule, self tours and more here. And make sure to check out our favorite spot, the resource library on the second floor! On the rooftop of CCGT with Sue. What a view! It’s amazing how far sustainable building has come in the last couple of years…at least on my radar. When I see the green options for countertops and flooring that you have at GHE, I’m blown away!